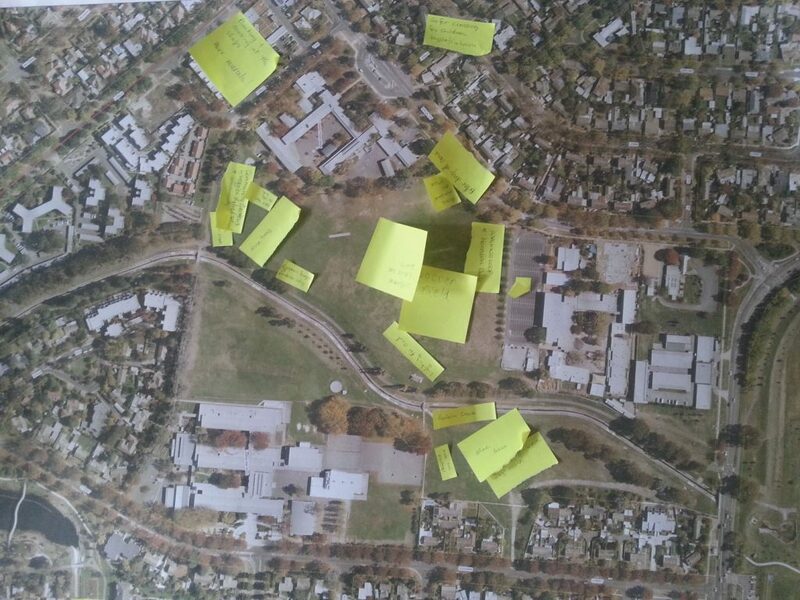 Great to see so many people engaged with future possibilities for Lyneham Oval and the wider area. The Lyneham Community Association had a steady stream of people at our stall at the fete, keen to add their ideas to our maps and to chat about their suggestions for improvements to the district. Thanks to everyone who contributed. Planting and seating at the shops. More murals! Q: is the wetlands pump functional? properly maintained? is the biotype destroyed when the pond is emptied? Reclaim Sullivans Creek (between Mouat St and LPS-LHS bike path). That is, get rid of the concrete and make it appear natural. More tree plantings in area east of creek just south of Mouat St.
Fenced in off-leash dog park in area east of creek just south of Mouat St. Fix and revive North Lyneham Oval. Currently not fit for use except dogs pooing. So a bunch of ideas, who is promoting and lobbying (the reasonable, useful, logical ones) to ACT Gov? Anyone? Access Canberra (a government shopfront)is needed in north Canberra to replace the one lost from Dickson. At the moment the alternative is at Belconnen as that in Civic doesnt cover all functions required by the public. Thats lots of bus journeys or parking charges, time and frustration for the older members of the community. Lol. That is someone just having a toss at me.